After continuing our journey with John Crichton last week with “Natural Election” and “John Quixote”, our Farscape re-watch continues this week with the eighth and ninth episodes of Season 4. “I Shrink Therefore I Am” is another of the fourth season’s extremely fun comedic, or at least lighter, episodes, following up on the previous episode, “John Quixote,” which had many comedic elements but also had deliberately dark, discordant, and twisted ones, as well. One of the interesting things about Season 4 is that it actually probably had more “light” episodes than any previous season. Even “John Quixote” counts to a degree. That isn’t to say that the characters aren’t in genuine danger here but there is nothing that matches the edgy vibe of previous seasons’ “comedic” episodes. Another example is the earlier “Lava’s a Many Splendored Thing,” which was full of a lot of the zippier side of Farscape‘s humor, particularly when it comes to bodily functions, but which didn’t have anything as disturbing as you’d find in “Crackers Don’t Matter” or “Scratch n’ Sniff” or “Won’t Get Fooled Again” or, again, “John Quixote”. And two episodes from now, we get “Coup by Clam,” which features more bizarre elements a la some of the previous examples but which also is overall much lighter and sillier in tone than most of them. And my theory is that the reason for this many comedic episodes this season is that, overall, it’s such an incredibly dark season that it required more moments of levity to provide some relief. The funny thing is that, despite all of the funny, this season is still primarily remembered for its darkness, and that’s because the dark episodes sustained an atmosphere that far exceeded any of the previous seasons’ darkness, and so while the comedies break it up a bit, they manage not to undercut the general tone of this year, which seems to be by design. It allows the show to take Crichton and Aeryn to some very dark places before their ultimate triumph in “The Peacekeeper Wars” while also not letting the series get too oppressively bleak, instead using comedy to let some air in the room, as it were. It had been a while since Farscape had done one of their “sci-fi chestnut” episodes at this point, and in some ways, this one hearkens back to some of Season 1 and Season 2’s stories such as “Through the Looking Glass” and “Out of Their Minds,” but this time rather than doing “ship split into alternate dimensions” or “body swap” story, respectively, we get a Honey, I Shrunk the Kids/Fantastic Voyage sort of adventure, in which all of the crew, except for Crichton, are shrunk by a group of robotic bounty hunters for easier transport, leaving him to have to rescue them all, briefly even teaming up with Scorpius to do so, before the latter is captured, as well. If I have one partially negative criticism about the episode it is that, with the shrunken characters spending most of their time locked in cup-like prisons, it doesn’t always take as full advantage of the potential possibilities of the premise as one might like. On the other hand, however, this was undoubtedly due to budgetary concerns. It’s highly unlikely they would have been able to afford an entire episode of a tiny Moya crew running around and actually make it look good, and they do at least get to have some zippy fun with mini-Aeryn riding a DRD, and in the climax, Crichton and the Scarran bad guy repeatedly growing and shrinking and growing and shrinking amidst their fight. Had they been able to truly go crazy with this episode, it could have been a masterpiece (I could see the Farscape comic having been able to handle this story really well), but even with its limitations, it’s still an extremely entertaining hour with many clever twists and turns, along with some troubling long-term implications for our characters, in terms of the arc to which the season is gradually building. At the start of the episode, when John and Noranti are returning to Moya from a grocery run, the bounty hunters have already boarded Moya and captured her crew, and so when Pilot cleverly signals to them that all is not right–“Ka D’Argo is currently helping Rygel with his…laundry. And Aeryn’s writing some…poetry…[Chiana and Sikozou are] enjoying each other’s company, preparing a meal for everyone but Rygel. He’s…not hungry.”–John again wonders if his nightmare scenario regarding Scorpy is playing out. Significantly, this scene echoes Pilot’s seeming caginess when they first reunited with Moya in “Promises,” at which point Scorpy first revealed himself to be on board, and then Scorpy’s attack on the ship in the game in the previous episode, which John briefly wonders if he’s still stuck in, after all, here. He eventually, however, sees the smaller ship that has attached itself to Moya’s side, and realizes there are external forces at work here, which he takes a first strike against by smashing his transport pod into their ship, instantly destroying their means of escape, a classically funny and foolhardy Crichton plan in action. Even funnier, however, is the fact that these “Battlebots,” as John comes to call them, assume that Crichton is a beyond-formidable foe. After all, he has fought off the PKs and the Scarrans for so long, and people such as Scorpius and Grayza want him so badly–the same assumption the Scarran made in “Look at the Princess,” which is significant, given the leader, Axikor’s, true identiy. “Crichton’s alive,” Axikor says, “and ingenious”. The ironic look on Aeryn’s face speaks a thousand words. However, one can see why John’s moxie might lead enemies to think that of him, because he always perseveres, here tricking the various bad guys numerous times in ways that a traditional hero might find ridiculous, utilizing the help of the always-helpful (and adorable) 1812. I particularly love the moment that he leaves out an overloading pulse pistol, which a Battlebot instantly shrinks so it leaves only an ant-sized little puff of an explosion, but he actually did so only to distract it and then attack it with a jury-rigged “bear trap”. And even later, he allows himself to be captured but actually in order to relay a crucial piece of information to his captors: that their boss isn’t who he claims to be. He’s actually a Scarran, meaning he will deliver Crichton to them, not Grayza, meaning no reward and likely death for the other ‘bots, which is exactly what happens. And, interestingly, the only reason John learns the truth is actually his most hated enemy, Scorpius. Crichton’s initial instinct that Scorpy had gotten out and betrayed them is proven not inaccurate, at least in regards to the first part. Upon first arriving back on Moya, Scorpy is out of his cell, and John wonders for a moment whether he might be behind the current strike. Scorpy, however, first reveals one truth to him: he could have gotten out of the cell any time he wanted but hadn’t wanted to, in order to prove himself to John. And over the course of the rest of the episode proves further loyalty by helping him throughout. Now, of course, Crichton isn’t naive so he still doesn’t fully trust him, nor should he, but at least at the moment it seems to imply that it is actually in Scorpy’s best interest to be an ally rather than a foe. And the crucial thing he discovers is the aforementioned fact that the bad guy is actually Scarran, which leads to the also-aforementioned grand showdown that culminates with a full-sized John stamping on the tiny Scarran like a bug, leaving him a literal bloody splotch on the floor. SIKOZOU: …this can’t be happening. SIKOZOU: No. No, reduction by propotionately subtracting atoms would leave our brains too simple to function. RYGEL: So, maybe they just made all our atoms smaller. SIKOZOU: But then we couldn’t breathe normal-sized air molecules, don’t you see? No. No, this isn’t happening because it is not possible! RYGEL: Your brain isn’t fuctioning. Do you think this is all just a hallucination? Do you like that explanation better? Hmm? RYGEL: Neither can I. Who cares? We’re here. They did it. And that’s that. You consider yourself intelligent? RYGEL: Then stop behaving like a child. SIKOZOU: I am not a child! RYGEL: No, you’re an infant. You’ve studied, but you haven’t experienced. You know nothing of life! RYGEL: I’ve been around long enough to know how ignorant I am. I don’t assume the universe obeys my preconceptions. Ha! But I know a frelling fact when it hits me in the face. For starters, this is a fantastic scene for Rygel, possibly my favorite in the entire series, because it really shows him at his most sagacious and simultaneously mature. Sikozou fancies herself a suppository of knowledge, always marching in and trying to take over situation because she’s read about them in books. Rygel, however, is hundreds of cycles old, has spent a staggering amount of time as a prisoner and then on the run, and has experienced both hardships and the universe in ways that most people, let alone initially pampered monarchs never do. The other crew members may find her simply annoying, but he–despite his small stature–looks down on her for feigning mastery of that which she has no real practical experience in, and here, he finally puts her in her place in a way no one else has up to this point. At the same time, on a metatextual level, the show is also addressing the potential scientific holes in the premise directly, cutting viewers off before they can complain about them. “But how can they breathe? How can they think? How can the comms work perfectly?” they might otherwise have asked. Farscape is basically reiterating that it is a show that cares more about emotion than strict adherence to physics. At the same time, it’s actually confirming this as being part of a deeper philosophy, namely that “there are more things in heaven and earth, Horatio, than are dreamt up in your philosophy”. In other words, sometimes seemingly unexplainable things occur, but the fact that we can’t define how or why based on what we believe to be true of the universe doesn’t mean that these things haven’t happened. Scientists of Earth may have extrapolated based on their compiled evidence what is or is not seemingly possible, but that doesn’t mean the same rules necessarily apply everywhere, nor that today’s scientific fact won’t be disproven tomorrow. Given that, Farscape is telling us not to shrug off the seemingly impossible because perhaps one day it will be true. After all, this is a show that features living ships who have literal gods. Is the idea of shrinking someone in a way that allows them to carry on with their lives as small beings really that big a stretch in that context? –One of my favorite nuances of the episode is how John at times hums along with the score, as if he is imagining himself the start of a “real-life” action film. –The way that Crichton discovers how to operate the shrinking ray is that Chiana uses her slowing-down-the-present power in order to learn the code one of the baddies enters into his keypad, a very intelligent use of the conceit. As with the show’s always sparing use of its recurring villains, which is happening again this season with Grayza, it also uses Chi’s powers only when it’s most direly needed, which is very smart, because it keeps it from feeling too easy, predictable, or redundant. Furthermore, it has a sizable cost, which might be getting even more dangerous now, hinted by the fact that her resulting blindness lasts longer than ever before, to the point that she worries she won’t get her sight back. This means that every time she actually uses it, she’s making a potential sacrifice and putting herself at risk (another reason she doesn’t do it every week), which makes her even more heroic, impressing Aeryn deeply here, which is always nice to see as Chi doesn’t always show her her best qualities. –This episode also reveals the first Scarran that isn’t a body-sized puppet but instead a person in make-up and prosthetics, which we learn is what the ruling class of Scarran look like, which is interesting, as it implies that the more highly intelligent/highly functioning one is, the more humanoid one looks. They likely have spent more time with the special flower first glimpsed in “Incubator” than the more brutish foot soldier types, which might have affected their very physical development. –You also gotta love that Noranti spends the majority of the episode floating outside the ship, in a magical-herb-induced coma that allows her to survive the vacuum. –Another great moment that isn’t explicitly explained but which a viewer can extrapolate from the clues: for a moment, D’Argo, Rygel, and Aeryn all speak at once, and we hear them in their own languages. We can assume that what happened is that they were making a concentrated effort to overload their captors’ translator microbes to distract them. But I love that the show expects its viewers are intelligent enough to connect dots such as that on their own. –Some of the quick flashes Crichton has of memories of Aeryn and him are actually from the other Crichton, one of the first subtle clues that he and the dead John are truly becoming one, on a literal and metaphorical level. There is another big hint in the very next episode. –And at the end of the episode, Pilot and Moya discuss with Crichton and Aeryn the possibility of leaving the Uncharted Territories all together in order to avoid the PKs and Scarrans, and instead going into an area known as Tormented Space–an absolutely perfectly atmospheric and deeply resonant name for a place to travel in such a dark season. Aeryn, in the final shot, seems particularly disturbed by the necessity of going there, and although it isn’t confirmed, I’d always assumed that she might have spent some time there while away from Moya. Structurally and stylistically, “A Prefect Murder” is one of Farscape‘s more interesting and unique episodes. Rather than having a traditional teaser in which the first few scenes occur, then followed up on after the opening credits roll, in this episode, the teaser is composed of a number of shorter fragments of scenes that are then revisited in Act 1, most longer and some from different perspectives, so that the parts we saw in the cold open fit together with the ones we already saw like puzzle pieces. Furthermore, Aeryn is experiencing a number of strange visions, which are hard to decipher at first–are they perhaps flashbacks from her time away from Moya? flashes of the future she’s somehow experiencing? simple hallucinations?–which adds to the non-linear surreality of the episode. And what might be most impressive about it is that the show grants the audience absolutely no hand-holding whatsoever. There is no built-in guide or obvious cues to establish for the viewer what exactly is going on (versus, for example, “Scratch n’ Sniff,” which was immediately upfront about bouncing backwards and forward in time; that episode was overtly psychedlic and acid-trippy, whereas this one is more subtly dreamlike, where everything feels only slightly off). Only when elements of scenes start to recur in slightly different ways do we come to realize the episode’s structural eccentricity and innovation, and since even at that, things seem to be happening at least slightly out of order throughout the first act, it requires attention and work on the audience’s part to assemble a cohesive narrative. This fragmented style creates an atmosphere that perfectly complements Aeryn’s fragmented mental state throughout the first half or so of the episode. On a first viewing, when we see her start to open fire on a crowd of people, including D’Argo, we might think it’s a bizarre dream or even that she is perhaps carrying out some sort of embedded sleeper directive from when she was an assassin. Neither are exactly or fully true, but her mind has indeed been coopted, a mystery that unravels as the episode proceeds. 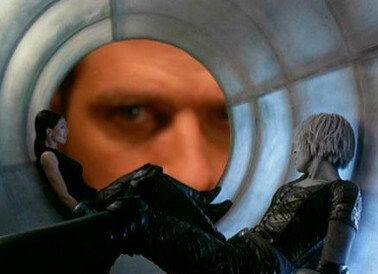 While this isn’t a story that has a great deal of bearing when it comes to pushing the overall seasonal narrative forwards, it continues to explore the murky emotional waters in which particularly John and Aeryn find themselves this season, further enhances the even-for-Farscape unusually surreal terrain of the year, and challenges the viewer from start to finish. Stripped of its external trappings, the story is rather simple–while visiting a planet filled with rival clans who have only recently found peace, Aeryn is stung by a bug controlled by someone working for the current leader of the planet, the Prefect, which compels her to assassinate the clan leader next in line for the Prefecthood. Being an outsider, she is a perfect patsy, all the more so–though the Prefect likely doesn’t realize it–because even her friends might suspect she is following through with orders from the assassination squad of which she was recently a member. Shortly after discovering the truth, however, John is stung, as well, both his and Aeryn’s bites attempting to coax them into shooting one another, and thus removing all evidence of their existence. Although when it comes down to it, this is a fairly straightforward story, the more complex structure allows the show to mine deeper and at times more operatic resonance from it. The deliberately disjointed and discordant editing of the teaser and first act, interlaced with Aeryn’s visions, followed by the actions she performs as a result of said visions–which we later realize to be the orders sent to her via her bug bites–helps enhance her genuine trauma at what she has been forced to do. In the past, Aeryn was a soldier and would not have blinked at following orders that led to the deaths of innocents, as long as her PK commanders told her it was necessary or right. Recently, she tried to ignore her conscience again and, while apparently her actions as part of the squad were far more morally justifiable to her than those as a PK, they did require some level of shutting off her “humanity,” something which has been increasingly difficult to do since Crichton came back in her life, or vice versa. When she is around John, she feels her humanity as she does at no other time, because his presence makes her experience love and therefore compassion. And now she is again with John, as well as pregnant, possibly with his child–one vision the bug gives her of herself striking a child being symbolic of the opposite of her current state; this is instead the behavior of other PKs, such as her former friend on the Command Carrier in “Wolf in Sheep’s Clothing”–and she ironically is forced to perform the most violent, horrific act she has done since leaving the PKs, which leads to internal anguish and remorse, despite not having been in control of herself at the time. 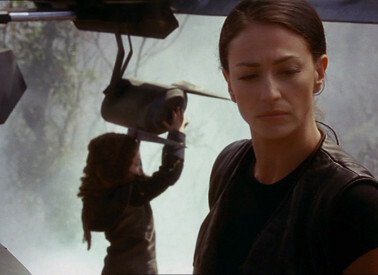 Meanwhile, the fact that Aeryn and John are then manipulated into pointing guns at each other numerous times and come very close to killing one another by the episode’s climax in some ways reasserts the recurring theme the show has been exploring ever since “John Quixote,” of John’s fears that their love could ultimately be destructive for the both of them as well as others surrounding them. The “future-flash” image in which they are both lying on the ground, breathing their last, while reaching out their hands for one another, is particularly operatic and powerful. There is a flip-side to this fear, however, which is the inevitability of their love, for despite the fact that John is actually still sniffing the drug from Noranti in order to block out his feelings for Aeryn, it doesn’t have any impact on the bug bite, whose control is so strong, that John feels no less compelled to obey it, despite himself. Which could be intepreted as a metaphorical sign to John–which he currently ignores–that, whether or not he attempts to ignore his true feelings, he and Aeryn are fated for one another, and the danger that constantly follows them will continue to do so regardless of the “precaution” of maintaining his distance. His loves and friendships are a strength, not a weakness, as evidenced by his friends being the ones to wrestle both him and Aeryn down before they can harm each other. The shot of them lying on the ground afterwards is an exact parallel to the “prophetic” one of their deaths, only this time they’re reaching out to each other in exhausted relief, a beautiful inversion of the earlier dark imagery. At the same time, one can see why the current situation would not be one to convince him that they are, in fact, anything approaching safe. He just has to eventually embrace that as a fact of their lives, as he will come to do so later. –This episode also features a fantastic, remarkably alive-looking creature in the form of the small, horned, ancient priest who looks a bit like a C. S. Lewis faun crossed with (and this was apparently deliberate), the demented old priest, Father Jack, from the hilariously controversial Irish sitcom, Father Ted. Much like the fetus-headed mystic from “The Choice,” the facial articulation is so eerily uncanny, it can be easy to forget it’s a puppet. And this is, of course, yet another surreal addition to the hour. –In addition to the flashes John had of the other John’s memories, this episode contains yet another subtle hint that the two are becoming one, literally and metaphorically, when John, without even thinking about it, responds to the Prefect saying that Aeryn seems moody, with “Man, you should’ve met her mother.” Which this Crichton never did, but taken in combination with the flashbacks, the show is indicating that this isn’t a simple continuity error, although it requires very attentive and perceptive viewing to put the clues together. –The episode even manages to give Sikozou a bit more softness via a romance she has with the son of the murdered clan leader who, despite having been raised off-world, is now set to be the next Prefect. This rather innocent affair stands in stark contrast to the very adult one she will carry on with Scorpy. I love your reviews! I’m glad you’re posting them again. I’ve been linking to them in the Farscape groups on Facebook. Now, I wish you would slow down, you’re going to get to the end too fast! I miss Farscape. I wish there had been (and will be) more Farscape.